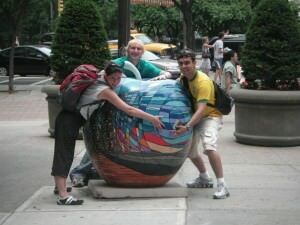 Doing New York on the Cheap Back in 2007: Some Good Travel Tips! 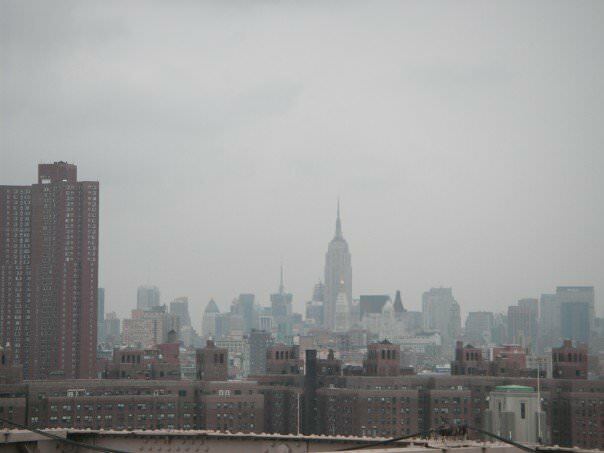 That unmistakable New York City Skyline which I once saw as a backpacker in 2007. Enjoying Brooklyn Bridge with Cassiano my Brazilian travel buddy. 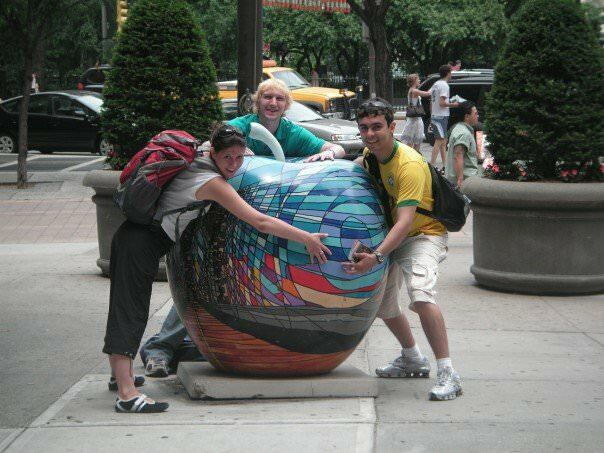 We found “The Big Apple” somewhere in New York with Nina and Cassiano my travel buddies. 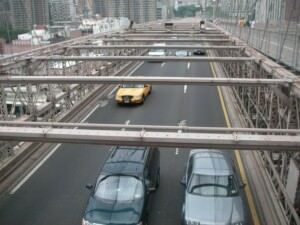 And before you comment and by the way…these are only a quick 10 things I did – I did other stuff as well and missed some key sights too – New York City is awesome and we all do different things, don’t forget to check my post because this is my journey! Explore Staten Island for FREE. The ferry is completely free – love stuff like this on my travels. To compensate though we ended up buying a beer or two on Staten Island itself but got home to the hostel yet again for FREE! I just checked again and yes the ferry won’t cost you anything. Free ferry to Staten Island, New York City. 2. A Night Out for $10 ALL You Can Drink! 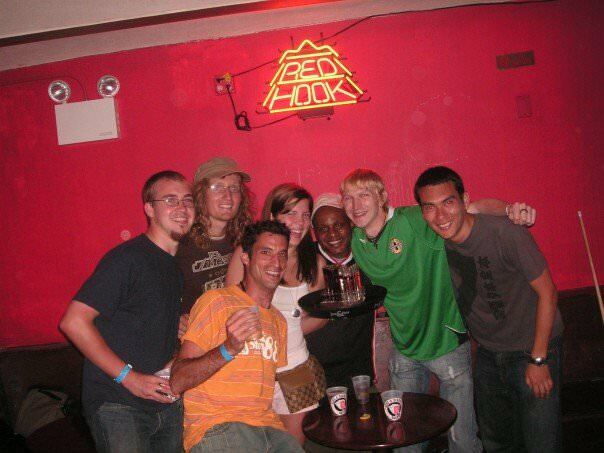 All you can drink for $10 US in New York City? We got smashed! SO I rounded up a decent group of lads from 7-8 different countries and off we went! We had 3 hours to take advantage of the offer, we drank them dry, had an international pool competition and I don’t remember getting home! This is still one of the best nights ever from my travels! 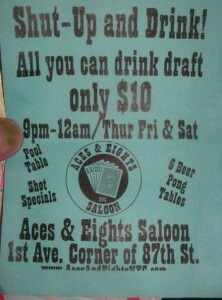 And you thought you couldn’t drink in New York on the cheap! 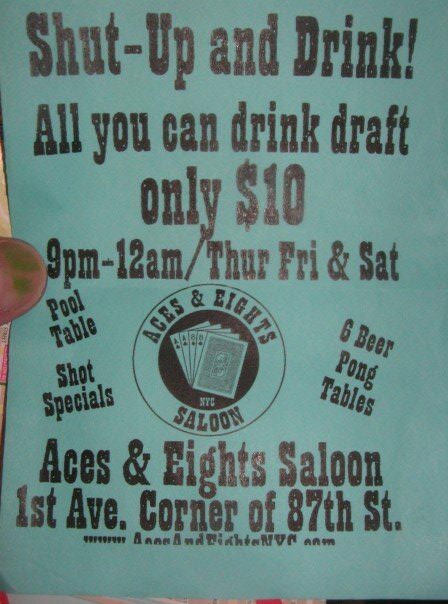 At a $10 All you can drink and cheap international pool night in New York City. 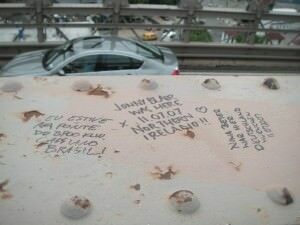 This was free in 2007 to walk across and well worth doing. It’s a marvellous bridge. Walking across Brooklyn Bridge in New York. We took our time and enjoyed the Skyline and the traffic. 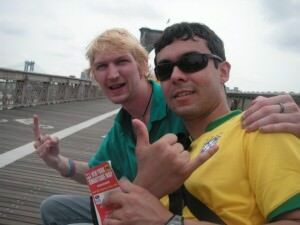 A shout out to Nina from Germany and Cassiano from Brazil, my two travel buddies. It was amazing to meet you guys! 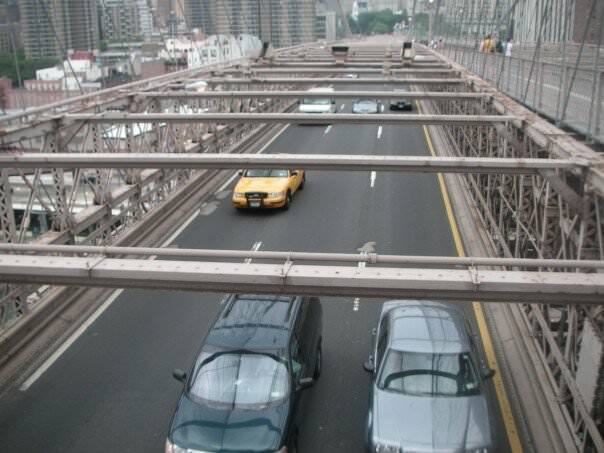 Crossing the Brooklyn Bridge in New York is free. 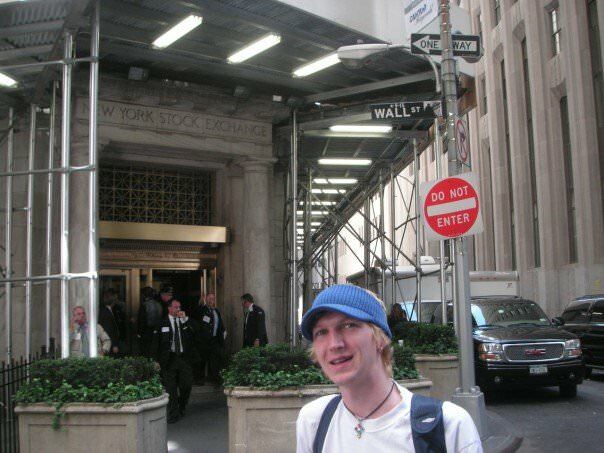 Walk round at leisure on your own and take it all in – Ground Zero, Wall Street…a city of endless walking. I visited the chilling Ground Zero and had a numbing experience. I wrote about it: WTC Path. Relax in the mid-day sun in Central Park. They can’t charge you entry to a park! Bring a lunch with you and a book. I do have photos of it, but this post is photo heavy at the moment! Washington Gardens is a decent garden park to relax in and even dip your toes into the fountain. 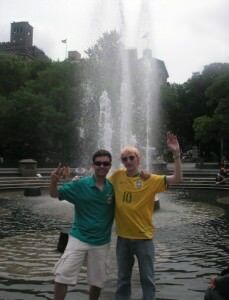 With my travel buddy Cassiano enjoying the fountain at Washington Gardens in New York City. Buy cheap food at the Mini Marts, Kwik E Marts and 7 11s – they even have cheap hot food. I admit I didn’t eat too much when I was backpacking in New York and even called into McDonalds a few times (I know, I know…) but the money I saved on that allowed me to go to the top of the Empire State Building, do the Circle Line cruise and have some beer at night. 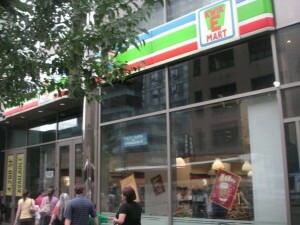 Kwik E Marts and 7 11s – cheap and cheerful food in New York City. Don’t do anything ridiculous like go to New York and stay in a hotel. Go cheap and hostel it – look at the money you’ll save. 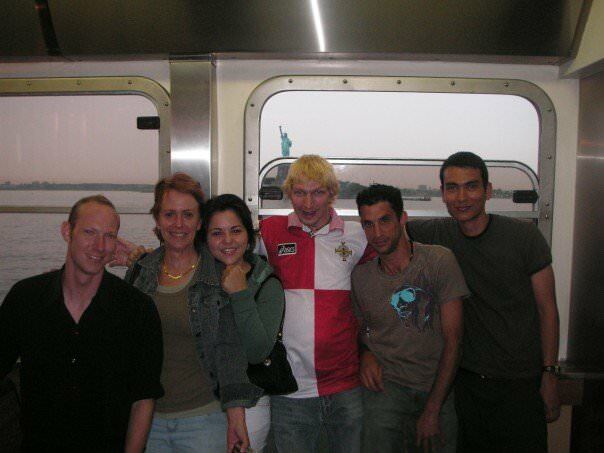 I stayed in the Hostelling International on Amsterdam Avenue. It was average but cheap enough. Next time I’ll find an even cheaper place though. 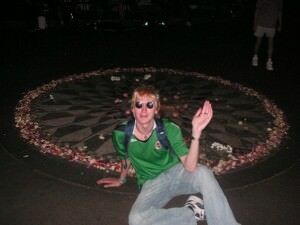 Yes it’s the famous Imagine Gardens, Strawberry Fields. If you’re a Beatles fan tick this one off. I was there on Ringo Starr’s birthday and ended up drinking free wine with some Beatles fans!! I even had my sunglasses on. Met a couple of really cool US girls too – I remember there names Cia and Kylie Salazar! Imagine Gardens, Strawberry Fields on Ringo Starr’s birthday. And just opposite Strawberry Fields is the Dakota Building. Yes, outside this building in December 1980 Mark Chapman shot dead John Lennon. I pondered for a moment taking it all in. What a sad loss. A poignant visit. It had been something I wanted to do all my life so I paid the fee and went up to the top. I don’t want to check the price again or try to remember how much it cost me because IT WAS WORTH IT. If you want to do it, then go there and do it – pay the money and go to the top. 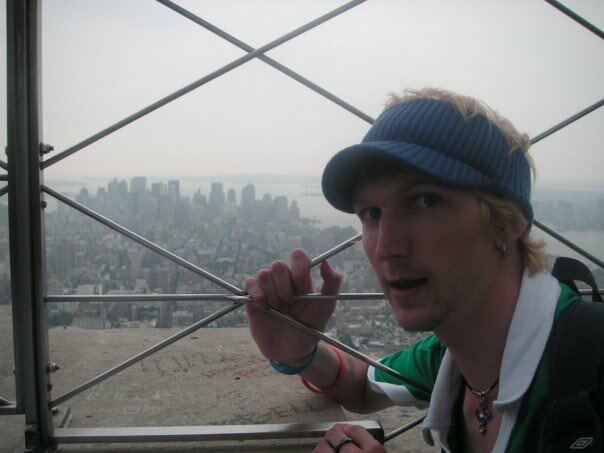 Yes you can do it at the Rockafeller Centre too, but it was the ESB for me and I LOVED it. Great memories! 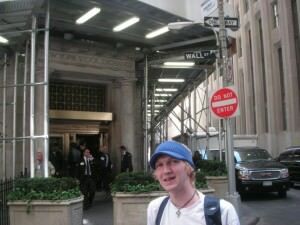 OK so this was also not totally cheap but I wanted to do a cruise round Manhattan – again a childhood dream so I researched the best one and got on the boat with Malachy Murray as he knows New York inside out. Malachy is an author – check out his Unique New York book and yes, the Circle Line Cruise was fantastic. Bring your own food and drink and relax. 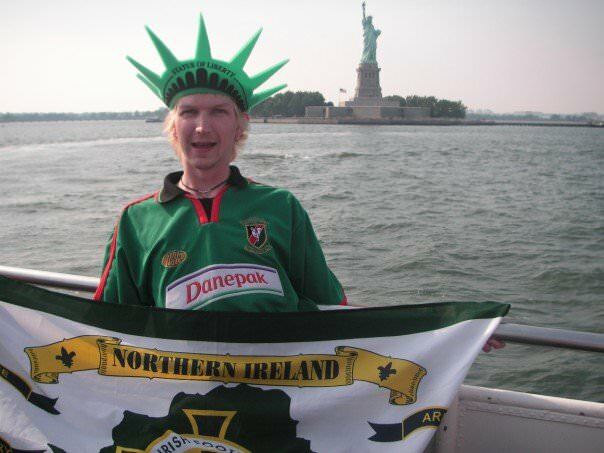 On the Circle Line Cruise round New York with the Statue of Liberty just behind me and a silly hat and my Northern Ireland flag. With thanks to Cassiano, Nina, Neil and Simon for the memories of New York! 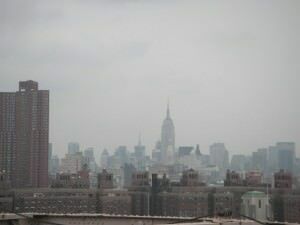 This entry was posted in Empire State, Lists, New York, North America, Staten Island, USA. Bookmark the permalink. I’ve gone at least 4 times between 2007 – 2011, many of your recommendations still hold true. * People watch in Times Squares – both day & night – “touristy,” but unique and FREE!! * Comedy Clubs in NYC – some go for little as $12 US for a 3 – 4 hour show if you look hard enough! Also, if anyone goes on the Staten Island Ferry, get off at the dock on Staten Island and within a hundred of feet is an impressive memorial to the 9/11 victims. If you look directly from the back of it, then it is designed to look like airplane wings pointing directly where the original World Trade Center buildings once stood. NYC is still by far my favourite city to visit! No many how many times I go, I can never get sick of it because there is always something else new to discover. Thanks for sharing!